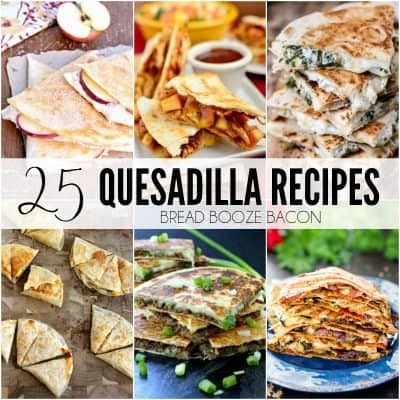 Need a crowd-pleasing appetizer for your party? Cheesy Pull Apart Garlic Bread is it! 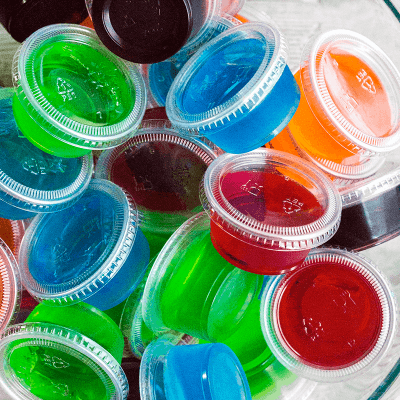 Fun to eat and extra delicious dipped in pizza sauce! I’m a carb-oholic. I admit it. I love bread and pasta and crackers and potatoes. I also love fun party foods like deviled eggs and this Cheesy Pull Apart Garlic Bread! It’s the best of both worlds. Little garlic bread bites with cheese stuffed inside ready to share with friends. What’s not to love about that?! The best part is you can prep ahead of time and then bake when ready. It’s a like savory monkey bread. 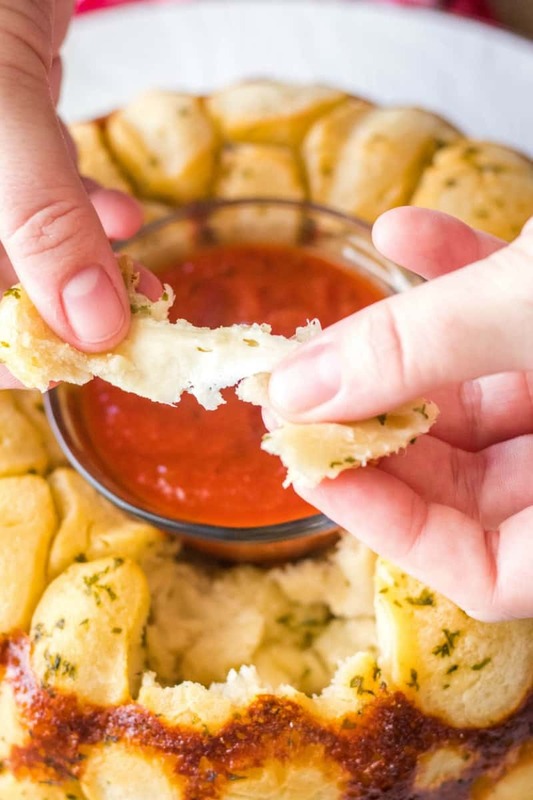 When I make this pull apart garlic bread, I like to use pizza dough. I make mine from scratch (per the recipe below), but you can absolutely cut down on the prep time by buying pre-made dough at your local pizzeria. And because I know someone will ask…yes, you can use biscuits instead if you prefer. I think the pizza dough works better but to each their own. Besides, once you roll the dough in garlic butter it becomes all about the garlic. Make pizza dough from scratch or use pre-made dough from a pizzeria. Cut dough into pieces. Cut mozzarella sticks into pieces. Wrap dough around cheese pieces. Roll dough balls in garlic butter. Put in Bundt pan. Put mozzarella between layers of dough balls. Bake until golden and cheese is melted. Let rest and then turn out onto a serving platter. Server with pizza sauce for dipping. This recipe does take some time. The pizza dough needs to proof and it’s an assembly line to put it all together. 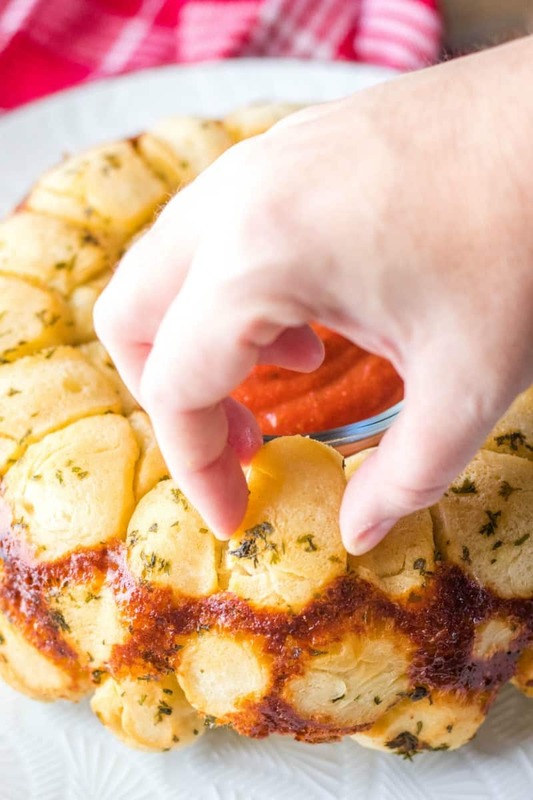 That being said this cheesy garlic pull apart bread is absolutely worth the effort. Work systematically to assemble the dough balls. 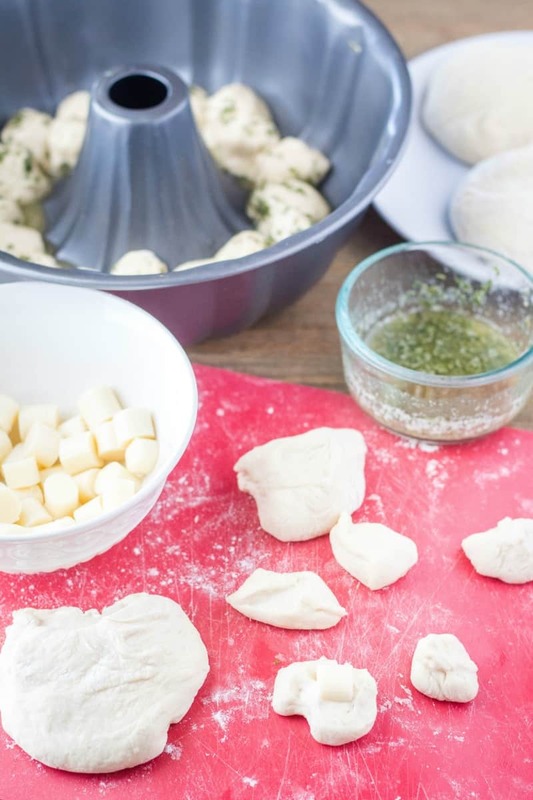 #1 – divide up the dough into all the pieces you’ll need. #2 – wrap the dough around the cheese. 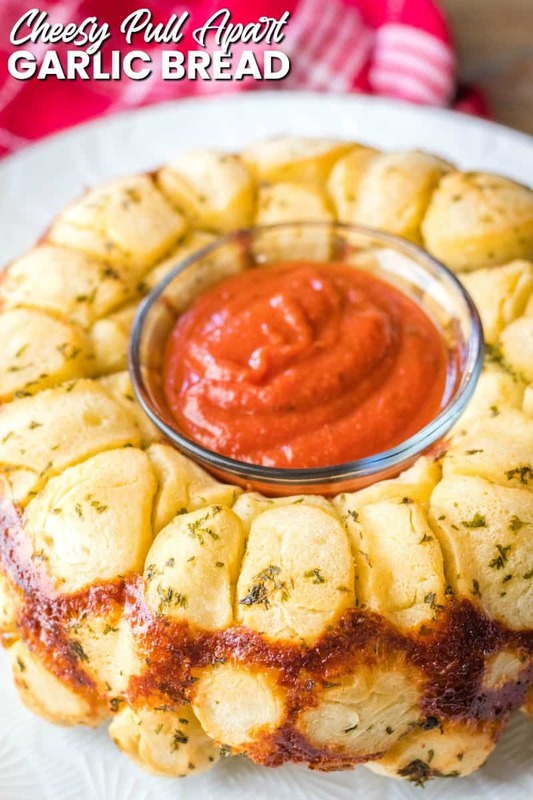 #3 – roll dough balls in garlic butter and pop in a bundt pan. This is much easier than doing all three steps with a quarter of the dough and starting over. AND you won’t have to wash your hands so often. Kepe some extra flour on hand for your fingers. While the dough might not be all that sticky on the outside, once it’s cut up it can get tacky and stick to your fingers. Dust them in flour to keeping things moving smoothly. I used mozzarella in between the dough ball layers. You could also use Parmesan or Asiago if you prefer for a bigger flavor punch. Don’t want any cheese? That’s okay too. You can make straight up pull apart garlic bread with this recipe too. 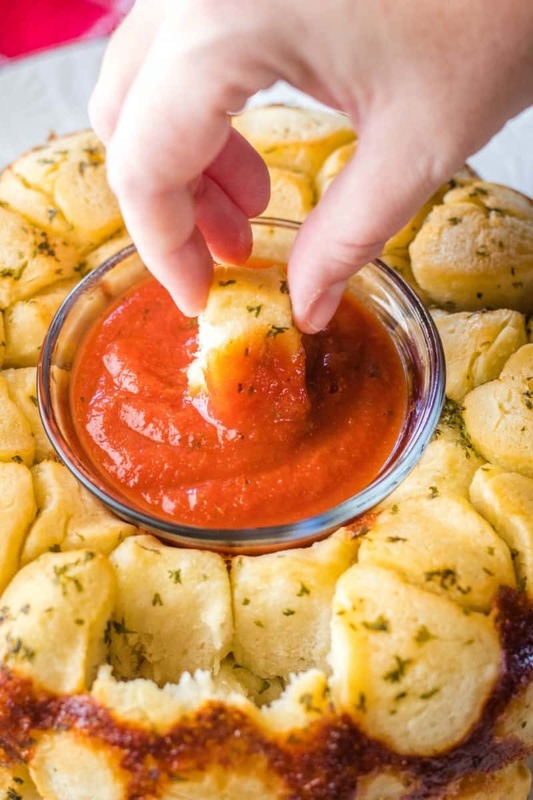 Want to make Pizza Pull Apart bread?! Pop a little pepperoni in with the cheese before wrapping it up in the dough. Just be sure to cut the pepperoni nice and small. 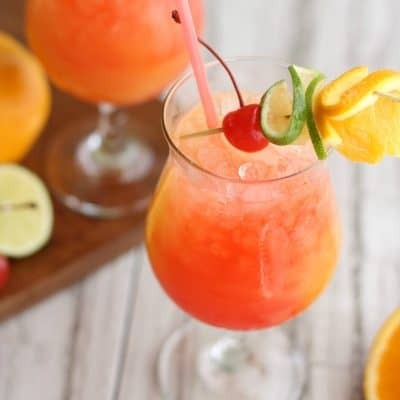 You really can’t go wrong with this recipe. Even my crazy picky kids loved it, but it does fir their MO. Carbs and cheese. 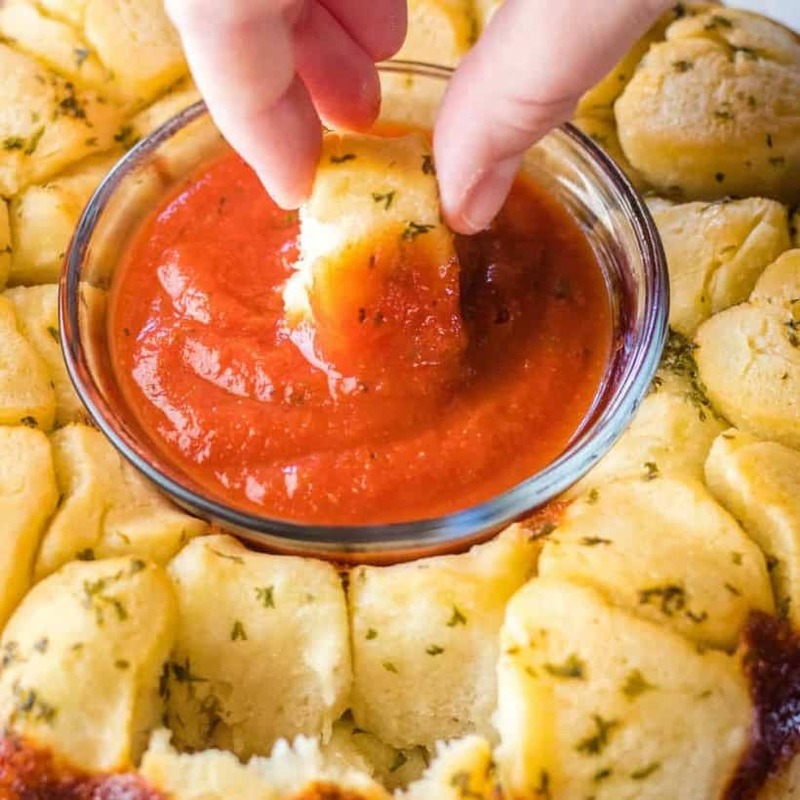 For serving, pop a small bowl of pizza sauce or marinara in the center of the pull apart garlic bread. Bundt pans are pretty handy for creating a dip bowl holding area. Heat water to 105-110 degrees F, no hotter. Add yeast and stir. Let sit for about 5 minutes to let the yeast bloom. Transfer dough to a lightly oiled bowl, cover with a kitchen towel and let the dough rise for 1 1/2 hours. Punch down dough. Remove from bowl and cut dough into quarters. Then cut each quarter in half so you have 8 medium-sized pieces. Cut each of the 8 pieces into 10 small pieces for a total of 80. Cut each mozzarella stick into 10 pieces for a total of 80. Wrap each dough piece around a cheese piece being sure to seal all the edges. In a medium bowl, melt butter. Stir in garlic powder and dried parsley until garlic powder is dissolved. Roll dough balls in garlic butter before placing in a bundt pan. 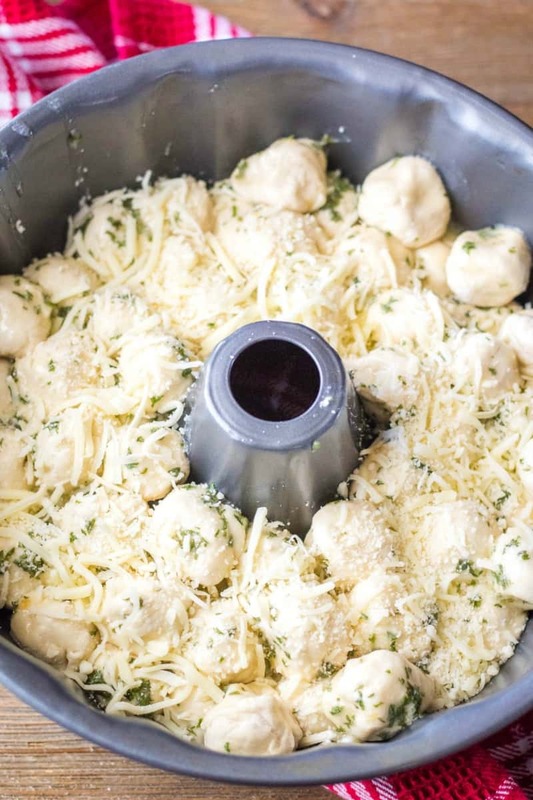 Once you have 1 layer of dough balls in the pan, top with 1/4 cup shredded mozzarella. Add remaining dough balls and then top with the rest of the shredded mozzarella. Set bread aside to proof while the oven preheats to 350 degrees F.
Bake for 30-35 minutes or until bread is golden and cheese is melted. Remove from oven and allow to cool on a wire rack for 10 minutes. Carefully turn bread upside down onto a serving plate to remove from bundt pan. Serve with pizza sauce or marinara for dipping, if desired. Pizza dough from your local pizzeria - You'll need about 1.5 pounds of pizza dough. Use the pizza dough as directed in the recipe. Canned biscuits (the cheap cans, not the fancy layered buttery ones) - You'll need 4 cans of biscuits (10 each). Cut each biscuit in half before wrapping around the cheese. 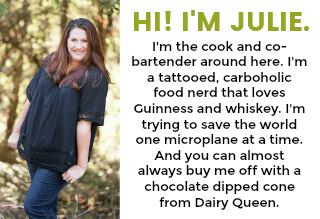 I use string cheese because I have kids and it always on hand. It's a SUPER easy option for me. You could also buy a block of mozzarella and cut it into 1/2-inch cubes.